William Shakespeare is one of the most revered writers and playwrights in literary history. For centuries his plays have been considered among the best works by critics ad audiences alike. They have been adapted and re-adapted time and again, both in books and onscreen throughout the ages. This past May Shout! Factory re-issued one of those countless adaptations when it released The Merchant of Venice. The adaptation in question was a 1973 TV movie produced by Associated Television (ATV) and itv in the UK. ABC handled broadcast duties for the special in the United States. Neither its first nor it last adaptation, there is plenty to appreciate about this incarnation of the timeless story beginning with the story itself. This will be discussed shortly. The work of the movie’s cast is just as important to note as the story itself. Last but hardly least of note in the movie’s presentation is in fact its very presentation. It is presented here exactly as it was in its original 1973 broadcast. 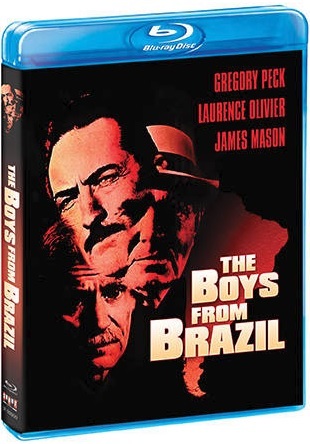 It rounds out the movie’s most important elements in its new DVD re-issue and is just one of the movie’s most important elements. Together with the movie’s other noted elements, all three elements join together to make Shout! Factory’s re-issue of ATV’s 1973 adaptation of The Merchant of Venice one of the year’s top new DVD and Blu-ray re-issues. Shout! Factory’s new DVD re-issue of ATV’s 1973 take on Shakespeare’s The Merchant of Venice is one of 2016’s top new DVD and Blu-ray re-issues. This is due in part to the movie’s story. Audiences will be pleased to know that the story presented in this incarnation has not changed one bit from Shakespeare’s original play. The only thing that has changed between the two stories is the play’s setting. Whereas the original play was set in Italy, one has to assume by the backdrop and costumes here that the story takes place in early 19th Century England. While the setting might have changed the story still fits interestingly enough. That is thanks to the story, which centers on young Bassanio’s attempt to win the heart of Portia. The problem is that in order to win her heart he needs the money to do so, which he doesn’t have. So how does he get it? He gets it by going to loan shark (let’s be realistic, that’s what he is—a loan shark) Shylock in order to obtain the funds. In the process Bassanio gets his friend Antonio wrapped up in his own problems by essentially making Antonio a co-signer on his (Bassanio’s) loan without his knowledge. This sounds like the setup for a drama. But in reality it is a comedy loaded with plenty of moments that will entertain audiences. Audiences will laugh happily as Portia and her friend trick Portia’s suitors so as to keep Portia from having to marry any of them. Bassanio’s reaction to the women singing right at him as he makes his choice is just as entertaining. Shylock even presents some funny moments in the story. One of the funniest comes as Shylock discovers the fate of his daughter for whom he was so worried. It shows the type of person that he really is. As despicable as he is, one can’t help but laugh at his reaction. It’s one more way in which the movie’s story, which again stays true to Shakespeare’s original play here—save for the setting—proves to be so important to its presentation in its new DVD re-issue. The story is just one way in which this take on The Merchant of Venice shows itself to be so enjoyable for Shakespeare fans. The work of the movie’s cast is just as important to note in its presentation as the story. 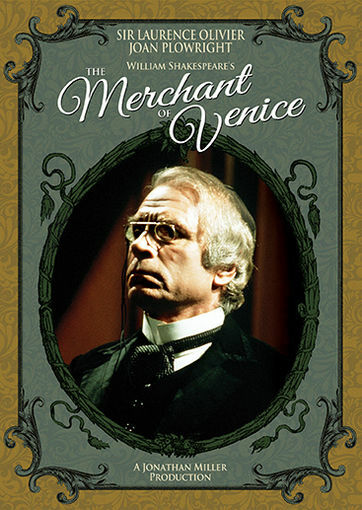 The story at the center of ATV’s 1973 take of The Merchant of Venice is a hugely important part of the movie’s presentation. Audiences will be pleased to know that even in a seemingly updated setting the story stays true to Shakespeare’s original play. While it is an important part of the movie’s whole the story is just one important part of the movie’s presentation. The work of the movie’s cast is just as important to note as the story. Lead actor Laurence Olivier is flawless as the money-grubbing loan shark Shylock in this presentation of the play. He completely embraces the character and in turn makes audiences love to hate him. He makes Shylock a completely unscrupulous figure. One can’t help but wonder, in watching Olivier’s performance if perhaps Charles Dickens might have in fact gotten some influence for Ebeneezer Scrooge from Shakespeare’s original Shylock in watching Olivier’s performance. Yes, this movie was presented in 1973. But the story goes back far more years than that, again leaving one to wonder if this character might have, again, been the original influence behind Dickens’ despised businessman. The similarities between the pair are inescapable. That is especially exhibited as Shylock shows no remorse in making Antonio Bassario’s “co-signer” even though Antonio isn’t even there to speak for himself. All Shylock cares about is getting his money back. Shylock’s reaction to the money spent by his daughter after she leaves home is another way in which Olivier shows his expertise. He goes in an instant to being completely worried about her to being completely enraged at the money spent. It is a wonderful moment. His is just one performance that makes this movie so enjoyable for Shakespeare fans. Joan Plowright’s take on Portia is just as fun to watch. Laurence Olivier’s take on Shylock in this version of The Merchant of Venice is a prime example of why the cast’s work in this movie is so pivotal to its presentation. Joan Plowright’s take on Portia is just as important to note. Audiences, especially female audiences, will love how headstrong and confident Plowright makes Portia. This confidence is exhibited throughout the course of the movie. One of the most notable moments in which it is displayed comes as Antonio reveals what Bassanio has done. She replies that they should basically pay him double and have the loan done with. Her matter of fact tone in addressing the issue will leave audiences laughing just as much as any of Olivier’s moments. In the same vein, her wit as she discusses having to deal with her suitors is just as entertaining. She says of one suitor that if she is to marry him, she may as well marry a hundred men. The tone of her voice in this delivery is hilarious and will have especially female audiences crack up because no doubt even today’s female audiences would be able to relate to some point to this moment. It’s just one more example of Plowright’s talent in front of the camera and one more example of what makes the cast’s work so important to the movie’s presentation in whole. It would be so easy to discuss the rest of the movie’s cast along with Plowright and Olivier. But that would take far more time and space than is possible. So suffice it to say that considering the work of both Olivier and Plowright joins together with that of their cast mates to keep audiences just as entertained and engaged in interpreting each scene as the story itself. Now, having noted this, the story and the cast’s work on camera are not the movie’s only important elements. The movie’s very presentation is just as important to note here as the story and the cast’s work. The story at the heart of The Merchant of Venice and the work of the movie’s cast in this incarnation of the play are both key elements in its presentation. The story stays largely true to Shakespeare’s original play, thus keeping it entertaining and engaging for audiences. The work of the movie’s cast is just as important to note as its story. That is because just as with the story itself, the cast will keep audiences just as entertained and engaged as the story. For all of the positives presented by the story and the cast in this take of The Merchant of Venice these two elements are not the movie’s only key elements. The story’s overall presentation is just as important to note as the story and the cast’s work. Audiences will note in watching the movie’s two-hour plus presentation (it comes in at just a little more than two hours) that it is set up as if it was a play being acted out on television. What that means is that instead of just being one long movie it is instead broken up into acts. This means that audiences will not feel like they have to completely invest themselves in the movie in one sitting. Rather, it allows audiences to stop the movie at specific points without feeling like they have missed anything and then come back to the movie later if need be. Or they can even stop it at the “act breaks” go use the restroom and get a snack, and come back for the next act just as if they were taking in the movie in a live setting. Even better they could do just that without having to navigate a sea of other people in doing so, too. This makes the viewing experience even better. It shows that even some forty-three years ago the people behind the presentation actually thought this through. That is good thinking to say the very least. And more than four decades later it still proves to be a hugely important part of the movie’s presentation. That ability to stop and take a break will actually allow viewers to talk about each act, clear their heads, etc. It enhances the movie’s viewing experience to no end. Keeping this in mind, it shows why the story’s presentation (exactly as it was in its original airing) is just as important to the movie’s overall presentation as any other element. Together with the movie’s story and the work of the movie’s cast, it rounds out the most important of this movie’s elements and shows once and for all why this version of The Merchant of Venice is a must see for any Shakespeare fan as well as on of the year’s top new DVD and Blu-ray re-issues. William Shakespeare is one of the greatest playwrights of all time if not the greatest. His plays have been adapted more times than any one person can count both on stage and screen throughout the ages. And next month Shout! Factory will re-issue just one of those many adaptations when it releases a made-for-TV take of Shakespeare’s comedy The Merchant of Venice. Shout! Factory will release The Merchant of Venice on Friday, May 17th. The 1973 take on the timeless play stars Sir Laurence Olivier (Spartacus, Rebecca, Clash of the Titans) opposite then wife Joan Plowright (101 Dalmatians, Dennis The Menace, Bringing Down The House) as Slylock. Plowright plays the part of Portia, love interest to leading man Bassanio (Jeremy Brett – My Fair Lady, The Adventures of Sherlock Holmes, The Sign of Four, The Hound of the Baskervilles). Bassanio is in love with Portia. But in order to win her hand and her heart he needs money. So he takes a loan from Shylock. The problem is that it turns out Bassanio can’t pay back Shylock’s loan. So it’s up to Portia to save Bassanio from a very bad fate. Anthony Nicholls (Othello, A Man for All Seasons, The Omen) stars as Bassanio’s friend Antonio. The movie is taken from the 1970 National Theatre stage production. Which also starred the same cast as is present here.